Available to Fellows and members of the College in good standing, our members’ room is conveniently located on the ground floor, immediately accessible from the entrance. 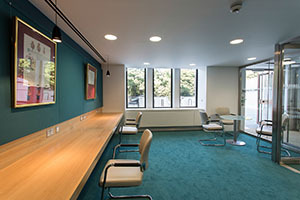 The room provides a spacious and relaxing area to work, with free tea, coffee and WiFi provided. We have eight meeting rooms of varying sizes with capacities of between ten and 30 people. 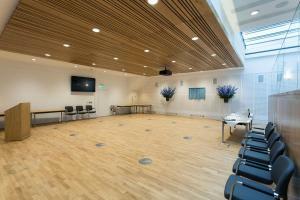 Located on the lower ground floor, the Wolfson Lecture Theatre is our principal multi-purpose space. The Wolfson can be set up in different layouts, such as a lecture theatre seating p to 90, a meeting or dining room for 30, a training, seminar or exhibition space, or a large area for receptions. 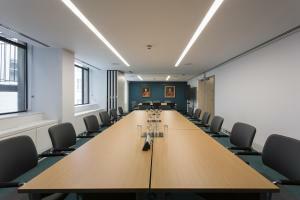 The building has been designed to facilitate virtual meetings. All meeting rooms are equipped with high-quality data infrastructure to enable WiFi, audiovisual, video conferencing and webinar services. 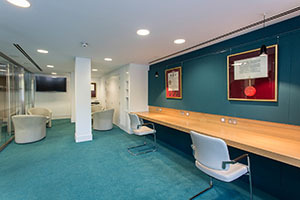 We offer room hire at 63 Lincoln's Inn Fields for Fellows and members as well as external organisations.